The importance of the 2001 Lincoln MK9 and 2003 Mercury Messenger concept cars at Amelia Island 2016 isn’t just that two fabulous designed cars are going to be one of the stars of show at Amelia Island but the real importance is that Bill Warner, is once again taking an avant-garde approach by making collectible cars of the 21st Century stars of a major concours for the very first time in the United States. Basically showing 21st century cars at a major concours has never been done, not to my knowledge. For a reference point, this is not the first time that a major show has stuck its neck out and stretched the boundaries of collecting. 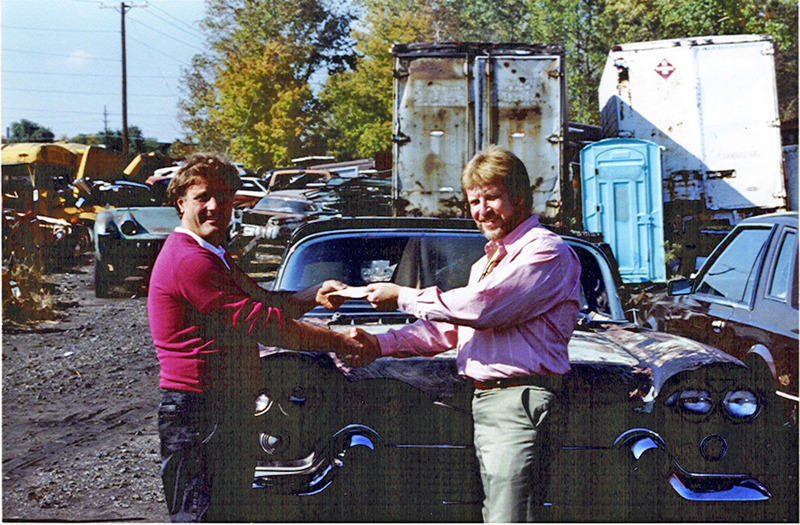 In 1989, Jules “J” Heumann and Lorin Tryon, the two gentleman that served as co-Chairmen of Pebble Beach Concours d’Elegance at the time, saw the handwriting on the wall that by only allowing cars that were registered with the Classic Car Club was very limiting and decided to test the changing focus and include post war cars. 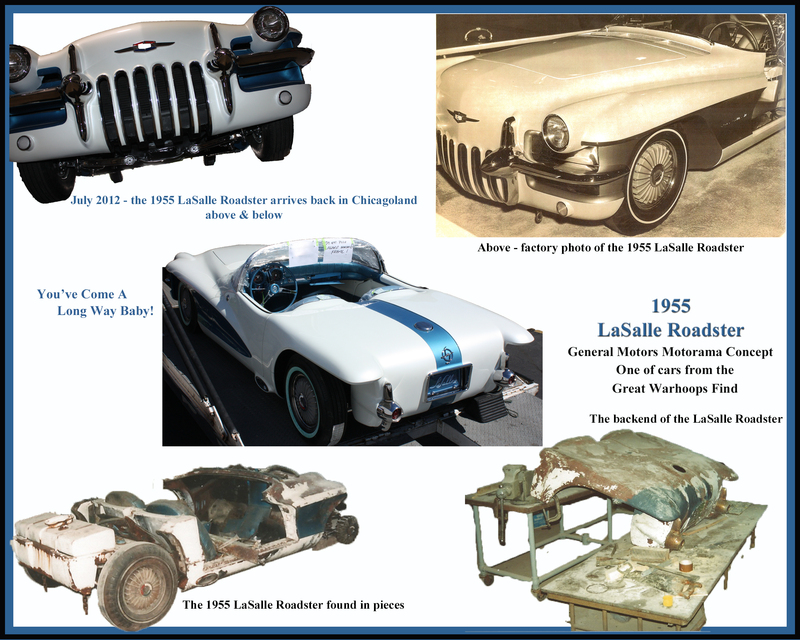 Their experiment was done by displaying the Bortz Auto Collection post war collectibles at Pebble Beach to see how the public reacted. 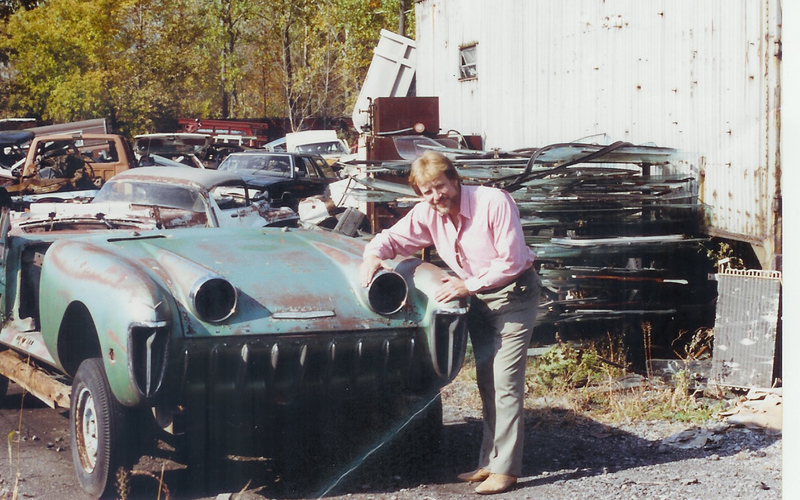 They felt that if there was a negative reaction to the showing of post war collectibles they could always claim it was just a special showing of dream cars/concept cars and be off the hook. However, the show was so successful in 1989, they brought back the other half of the Bortz Auto Collection in 1990 to be the stars of the show. As far as I know, this is the only time that Pebble Beach has ever had the same theme for the stars of the show two years in a row. I guess the point being that it was not only that Bill is making the 2001 Lincoln MK9 and the 2003 Mercury Messenger the stars of the show but he is putting them in the highest focal point of the show, which will be on the platform in front of the pond. Bill did this with the two LaSalles in 2013 (Link to Jay Leno’s Garage interview about the LaSalles at Amelia Island 2013) and this display of the two LaSalles on the stage by the pond also was the hit of the show. 2001 LINCOLN MK9 designed by Gerry McGovern and was the hit of the 2001 New York auto show. It is built on a Lincoln chassis with an Italian composite body and fabulous proportions and matching absolutely futuristic interior. The last Lincoln Mark VIII went out of production at the end of 1998. 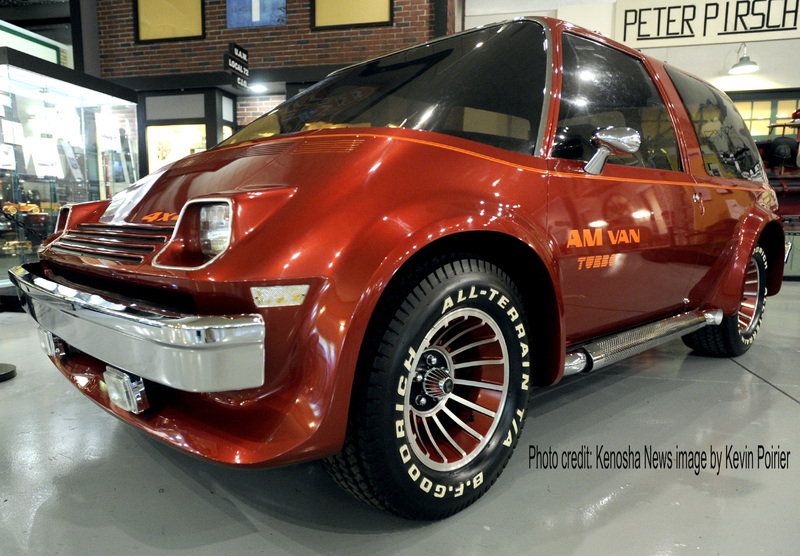 For three years, ambiguity reigned, until the April 2001 New York International Auto Show. There, suddenly, was a concept of what Lincoln envisioned for the future: the MK9. The 2003 Mercury Messenger is the car that was going to save and probably would have! It is a two-passenger car that’s design is filled with adrenaline. The proportions are perfect and there is not a bad side angle on the car. Be sure to take a look at the introduction of the car when it was dropped down from the ceiling at the auditorium on a platform with attached ropes – see video and fast forward to 5:58 of the video to see the Mercury descending from the ceiling. The car has an energetic stance accented by the spoked wheels that has a turbine theme with veins reflecting the Mercury Flying M logo. The functional veins helped to cool the brakes. The body was a lightweight aluminum hydro-formed monocle while forming part of the integral occupant safety cell. This experimental car was equipped with electric motors to drive it and to operate all its power equipment. The car was equipped with computer active independent suspension on all four wheels and anti-lock brakes with bimbo disks and high performance calipers. It is true that this car was originally planned to be operated by a V8 gas powered engine but secretly it was also the idea of either making it a high bred or possibly a full electric car. Since the Bortz Auto Collection acquired this car in 2014 it has enhanced the electric drive so that the car could be capable of speeds in excess of highway speed limits. The car is fully equipped with power steering, large disk brakes and full lighting system. These two cars are both designed by Gerry Mcgovern and allow Bill Warner, founder of the Amelia Island Concours, to be avante garde by presenting cars that are of the turn of the 21st century. Curator Don Shepard has done an amazing job of setting up the AMC display at the Kenosha County Historical Society located at 220-51st Place, Kenosha, WI 262-654-5770. Joe and I drove up to Kenosha to see the display and Joe was so pleased to see his 1977 AMC AM Van out for public display. 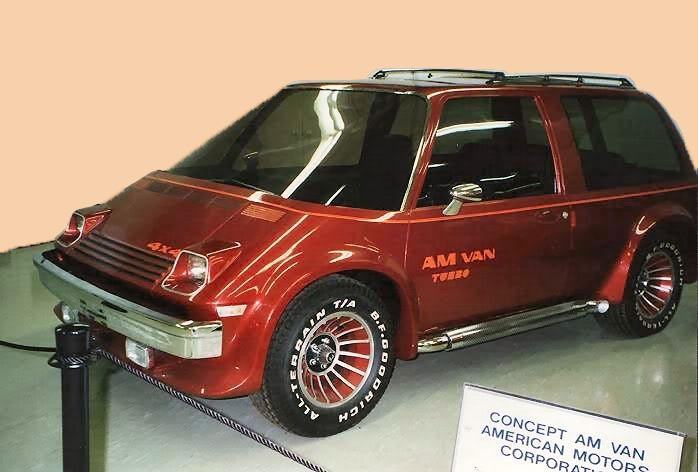 The AM Van has only been shown three times in the last three decades and the public’s response has been overwhelming. It seems that this showing was way over due. Many of the former employees of the AMC Kenosha UAW Local 72 are going to be having a reunion day on July 24, 2014 and have invited Joe to attend and to talk with the attendees about his 1977 AMC AM Van and to share stories with the employees. You can contact Jeff Schenning 262-818-7720 for more information on this event. Mike Spangler who is well known for his rare AMC 1971 AMX prototype, which was Richard Teague’s attempt to talk AMC into keeping the AMX a true two-seater, was very instrumental in getting the 1977 AM Van to Kenosha for the display. 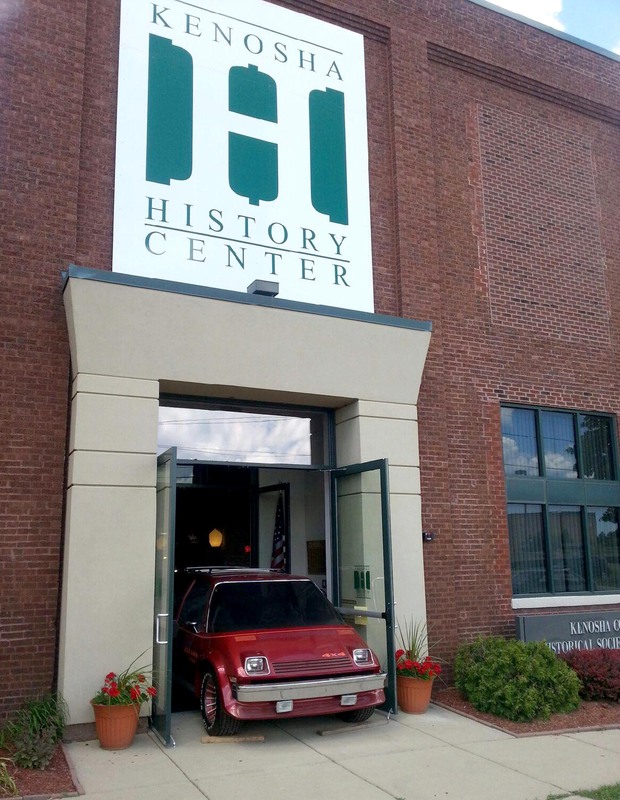 While we were at the Kenosha County Historical Society museum, we were extremely impressed with all of the fascinating displays and we are definitely planning on going back to spend more time viewing all of the displays. Well worth a trip to Kenosha!! This area is called Simmons Island and looks like a beautiful area to explore. We want to take a closer look at the two historic lighthouses, Pierhead Lighthouse known as “Big Red” and Southport Light Station  on our next visit. There is also a historic Beach House that is listed on the National Register. It’s a Tudor Revival structure at 5001 Simmons Island. The building is made of concrete, brick, slate and wood. Since it was lunch time we stopped at the Breakwater Bar & Grill, which was across the street from the museum. We were the first customers of the day and we had a beautiful view on the patio and the food was delicious and also creative! I had the beef and pancetta burger: Ground sirloin with Caramelized Onions, Sun-dried Tomatoes, Pancetta, fresh Spinach and stuffed with Gorgonzola cheese. OH MY GOSH, totally blew my diet but it was so worth it!! I would make the drive to Kenosha for this hamburger alone!!! If you get a chance, take a drive up to Kenosha to view the beautiful lake front on Simmons Island and enjoy all the interesting sites! 1956 Cadillac Eldorado by Brooks Stevens from The Bortz Auto Collection to be featured at the 2014 CCCA “2014 Grand Experience” at the Gilmore Car Museum campus in Hickory Corners, Michigan on Sunday June 1, 2014. The Bortz Auto Collection was honored to receive a request to have its 1956 Cadillac Eldorado by Brooks Stevens be the featured car at the 2014 CCCA “2014 Grand Experience” at the Gilmore Car Museum. 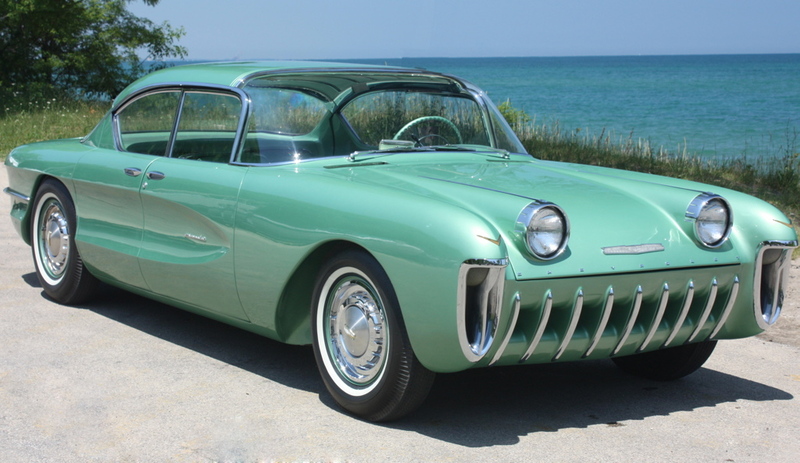 This concept car is one of two and was the one featured in 1956 throughout the European 1956 auto shows. It was also the headline grabber at several automobile shows in the United States, including the Madison Square Gardens annual car show. This Cadillac/Lasalle themed event will take place at the CCCA Museum on the Gilmore Car Museum campus in Hickory Corners, Michigan, on Sunday, June 1, 2014, from 9:00 a.m. to 4:00 p.m. There will also be a grand classic for all CCCA full classics. It is interesting to note that the Bortz Auto Collection was on exhibit for two years at the Gilmore campus museum building in the late 1990s. The Cadillac die Valkyrie is rarely shown making it a very special event for car collectors and spectators who have not had an opportunity to see this most significant concept car design. One of the more significant design features is the enormous “V” bumper at the front of the car. This was done because Brooks Stevens, an international car designer, wanted to have the car tour in Europe as well as the U.S. He wanted to show off the fact that most American high end cars were V8 while the Europeans engines were either straight six or straight eight. Brooks Stevens was also famously known for painting many of his other concept cars in his signature black and white color scheme. The 1956 Cadillac Eldorado designed by Brooks Stevens with a one off custom Spohn body for the auto shows of 1956 from the Bortz Auto Collection will be featured at this event. This is an event not to miss! Attendees will also get to view and enjoy the other five hundred quality automobiles on continuous display at the Gilmore Museum campus.